It is with great regret that I must turn in members of my own Cajun-American Olympic Knitting Team for recently discovered use of steroids. Please don't put them in jail over there in Italy, just send them home so I can put them back in the stash for rehab, okay? But how can I turn a blind eye to evidence like this? Caught in the act! 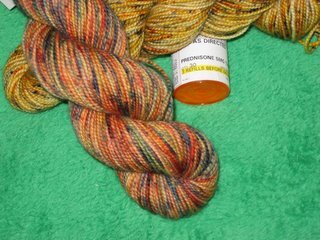 I have no choice but to discharge these members, as well as the rest if the Koigu Shawl Team from the Knitting Olmypics, leaving only the yarn in the Official Irish Drinking Hat Yarn Team to compete in the games. As the coach, I am shocked and horrified, but I have no choice but to replace these team members. 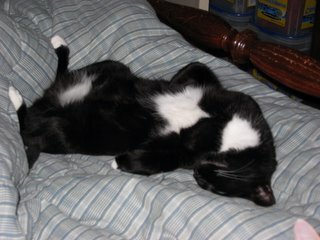 My assistant coach, completey wasted, absolutely loaded, passed out on the bed from catnip abuse. I cannot hold my head up in public today. Instead, I shall give the Official Irish Drinking Hat Team a good pep talk and pack my bags for Stitches. I need to get my mind off this. lol My dog has a prescriptiion for steroids - half a pill every other day. Except, vet filled the scrip last week for just in case, but switched her to an anti(histimne)trial - to get her off the roids! Hope I'm not accused of doping - with steroids in the house!! Well, as disapointed as I am in the assistant coach, I must admit that the assistant coach of the Cajun American team's Pacific Rim consultant, Tucker B. Louie was recently discovered snockered on feline Maui Wowie. I can only hope that the Pacific Rim consultant has not lured the cajun assistant coach into dangerous waters with this super powerful catnip. Perhaps we should all learn a lesson from this abuse. 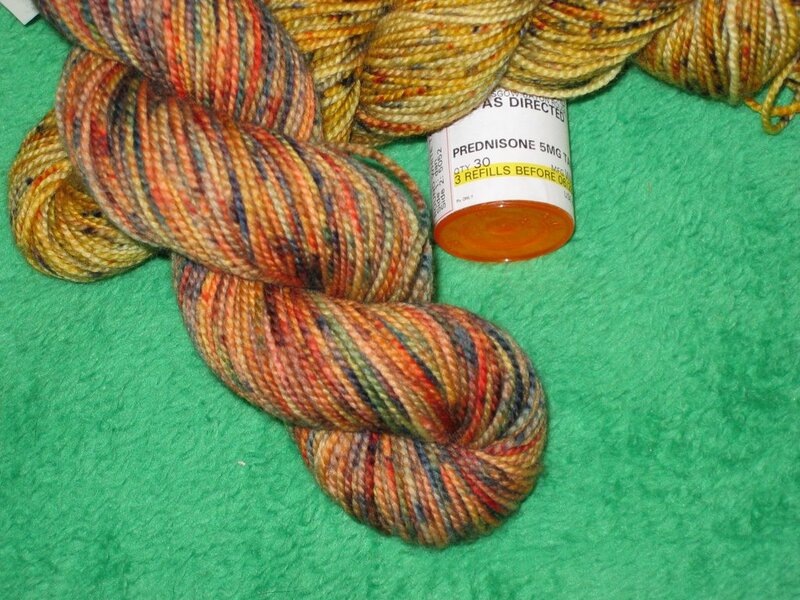 Fortunately, this steroid abuse does not seem to have spread to the Pacific Rim knitting contingent yarn. What is the world coming to? Ummm... I think the usual excuse for this group when hauled up in front of the IOC is that "The dog made me do it!"